Silver Siren. - 24 Nails. This all-in-one manicure kit gives you pretty, perfect, ping-proof nails in minutes! Check out the Elegant Touch Nail Guards we have listed too :D.
Oval False Nails. Squoval False Nails. Almond False Nails. Ballerina False Nails. Salon False Nails. Black False Nails. Blue False Nails. Brown False Nails. Almond False Nails. We start by adding a base colour, this is then sprayed with a glossy gel coat. We finish by adding a protective UV layer making them scratch resistant. Squoval False Nails. Oval False Nails. Trust Funs. Young Royals. - 24 Nails. This all-in-one manicure kit gives you pretty, perfect, ping-proof nails in minutes! ELEGANT TOUCH. Our collection includes fragrances, makeup, skincare and hair-care essentials, along with a full range of gift sets. NEW PRODUCT. 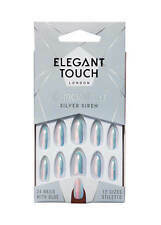 2 x Boxes Elegant Touch Limited Edition Crack Up Nails Short Length Nails Graphite Silver (235) * 24 nails with glue in 10 sizes. 100 Animal Stripes Acrylic Pre-Designed Nail Tips 9 Designs to Choose From! Hand painted Short Square press on toe nails. For longer wear, nail glue should be used. Toes - square. Nails are available as a Full Set of 20 (2 of each size, 0-9), or by size in a set of 10 (see below).